Lately it seems that everyone is fixated on food — its production, its enhancement, its delivery and consumption, and ultimately our evolving relationship with it. Amidst this food frenzy, progressive designers have sought new ways to grow food easily and in tight spaces. 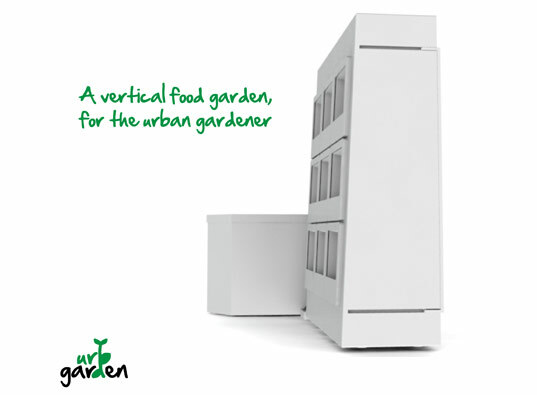 The Urb Garden, designed by Xavier Calluaud, is a vertical garden outfitted with modular cubby holes and an integrated worm farm, making it a perfect all-in-one solution for urban gardeners. As an added bonus, when fully planted, the Urb Garden looks a lot like an attractive green wall. Designer Xavier Calluaud illustrates the Urb Garden’s simple step-by-step process. Scraps of food are deposited into the worm farm, creating nutritious fertilizer. Water is added and the liquid fertilizer is delivered to the plants via a drip system. The water drains down the tank and then is pumped back up to be used with the next batch of fertilizer. As the plants grow, modular bins are easily removed for harvesting and re-potting. Modern society suffers from a lack of intimacy with its food, and the Urb Garden is designed to tackle the separation while also getting rid of the waste caused by commercial food sources. By growing food at home, consumers utilizing an Urb Garden can reduce their use of food packaging (by not buying their produce in plastic containers) and food waste (by composting and only picking what they are eating) in one fell swoop. So if you live in a dense metropolis and are itching to rid yourself of the modern convenience of commercial food, the Urb Garden is sure to be a practical and eco-conscious answer to growing your own healthy produce. Great potential! Let's all keep an open mind, grow what we can, and keep those creative ideas coming! Does it smell? 'Cause all the time I think about a wormfarm (never seen one in front of me), I assume it smells, as it's fed with garbage, no? I don't think anyone is pretending that bobocop. The point is to increase people's participation in the production of food, to increase their relationship with their environment which helps develop responsibility. Also we cannot forget that small-scale gardening is a relaxing past-time and the commitment of having nurtured your plants and watched them grow is a very attainable goal. Psychology tells us that attainable focused goals are what make people happy. I think this is a really great thing for people who live in urban settings because everyone I know in my town has a garden and you just can't do that in the city. My neighbours are always offering up fresh veggies as gifts - its good why are you being a downer. This is great! Very aestheticaly pleaseing which I think a lot of other verticle designs are lacking. This is fine for herbs, but for any vegetables that require long periods of sunlight, you run into serious issues. Vertical gardening is a nice idea, but always remember the plants have to get their energy from somewhere. Only if you live in a penthouse or on the south face of a building (I'm assuming norther hemisphere here), will you get multiple hours of direct sunlight. if you live on the east or west side of a building, you'll only get a few hours, and if you live on the north side, you won't get any direct sunlight! I'm all for urban gardening as a way of getting people to better understand how food is grown and the challenges it presents, but don't pretend that this will change the world. There is no way to get economies of scale going with individual gardens, so you quickly run into the limits and would have no hope of providing for yourself with vertical gardening. On a final note, most commercially produced potting soil add black carbon to the mix to give it that black color and to improve nutrient retention. However, black carbon is a petroleum product. So don't forget to add that to your energy calculations if you want to figure out if you're "being green" by doing this. So I think this looks cool, but it appears to just be a design project, and not actually in production anywhere? I don't see info about actually BUYING one in any of the articles on it. Any leads on whether it's getting manufacturered? Nice solution. Looks like a more complex and nicer-looking version of the old planter idea, using a PVC pipe with smallish holes in it, the whole thing filled with soil and hung vertically, with herbs planted in the holes. my guess is that its supposed to be next to a window or on a patio? Fertilizer system seems to be very well planned, however, isn't this missing one crucial element? How does sunlight penetrate inside the boxes? Lately it seems that everyone is fixated on food -- its production, its enhancement, its delivery and consumption, and ultimately our evolving relationship with it. Amidst this food frenzy, progressive designers have sought new ways to grow food easily and in tight spaces. 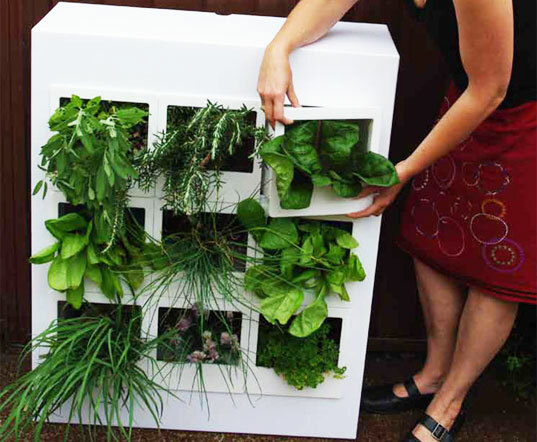 The Urb Garden, designed by Xavier Calluaud, is a vertical garden outfitted with modular cubby holes and an integrated worm farm, making it a perfect all-in-one solution for urban gardeners. As an added bonus, when fully planted, the Urb Garden looks a lot like an attractive green wall.